Keeping family and friends up to date on our travels in Florida, The Bahamas and south. 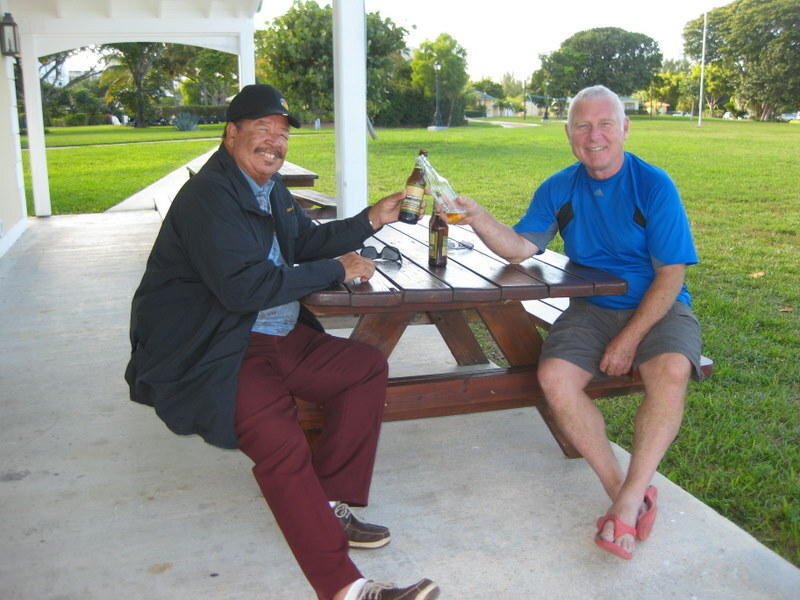 It was awfully nice at the Grand Bahama Yacht Club in Freeport but after two weeks it was finally time to go. We had been to the tourist place at Lucaya and had local Bahamian food and Greek food at Zorba’s. We went over to the posh Our Lucaya Hotel and wandered around the place and took our Christmas picture in the lobby. Pam bet the family fortune at the casino and had to be stopped before she got us into serious trouble. We explored the canals by dingy where the gorgeous homes are built and checked out the Dolphin Encounter location where you can swim with the dolphins. Pam had a haircut in the Lucayan Marketplace – better than last year’s cut in Nassau – short, but at least both sides are the same. We met and visited with lots of boaters. It was interesting to meet some new people and hear their stories. 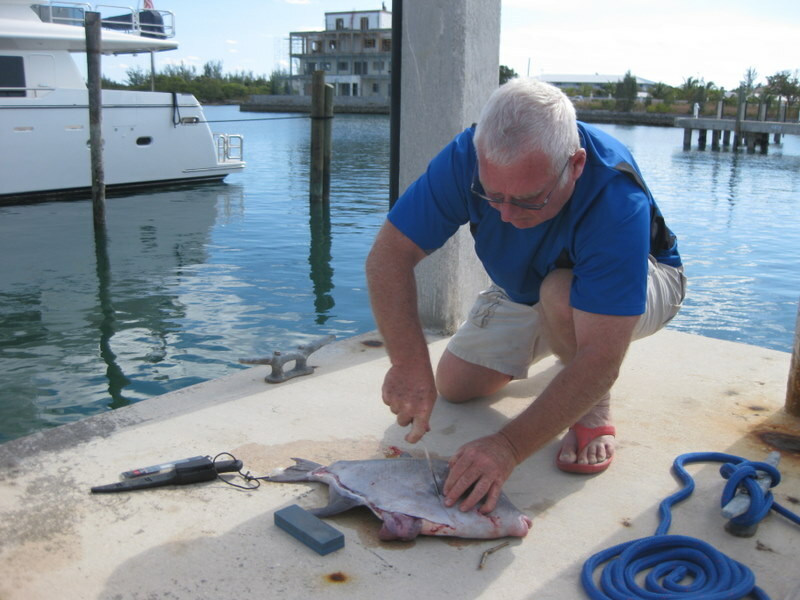 Cleaning a Triggerfish we bought from the lobster guy. So, after a particularly cold couple of days, (down to 9 Celsius) we left early (0630) Wednesday. As we readied the boat to leave, we watched the International Space Station travel overhead. We motored out the Bell Channel at sunrise and headed for Great Stirrup Cay. The crossing was uneventful – except we learned that our alternator regulator doesn’t work and an engine part designed to keep us from sinking was dripping water all over the engine. Unfortunately, the dolphin pod we encountered on this 56 mile crossing last year was not available so we had to be content with watching the flying fish as they skipped over the water, trying to get away from us. We had a quiet night at Great Stirrup – the stars were unbelievable and the moon was so bright that you could see the bottom in 12 feet of water (3.69 meters). In the morning we gathered our curled up anchor chain – not sure we needed an anchor that night, it was so calm – and headed out at 0700 for Nassau, another 50 miles. Pam has figured out how to use some hooks from last year along with “hoochie” skirts to make lures – rather than buy them at $12 a pop and lose them to a barracuda. WELL, do they ever work! We caught an 5 pound Yellowfin Tuna just before we anchored at Great Stirrup and then the next morning we landed a 3 or 4 pound Mackerel, an Amber Jack (could have been an evil Cravelle Jack so he didn’t come aboard - a local fisherman told us you could eat them but you'll get the 'shittins') and a Barracuda (also unwelcome on the Blue Pearl.) We’ll have to start throwing out steaks to make room for all the fish. We had better luck in 18 hours than we had in 4 months last year. Seared Tuna in ginger and sesame!!! We motored the entire way to Nassau. There was very little wind and what there was came right on our nose. After the initial flurry of fish-catching, the trip was uneventful. The Atlantis Resort in Nassau appeared on the horizon 16 miles away! We listened on the radio as a multitude of boats requested permission to enter the harbour. There is a good crossing “weather window” right now so loads of boats are coming into Nassau from Miami, Ft. Lauderdale and points north. After receiving our 'go ahead' from Nassau Harbour Control we motored past two huge cruise ships, under the two bridges, past Potters Cay and the marina we stayed in last year. We found a perfect spot to anchor (rather than pay $100 per night at a marina) and got yelled at by someone who thought we were too close to his marina. So we moved east 100 feet and now we are tucked in. 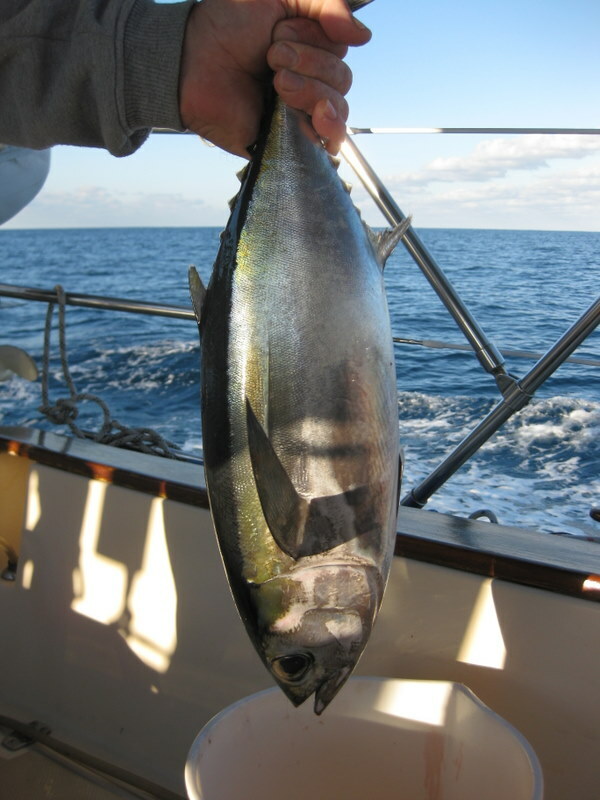 Rum punches and Holy Mackerel for dinner. 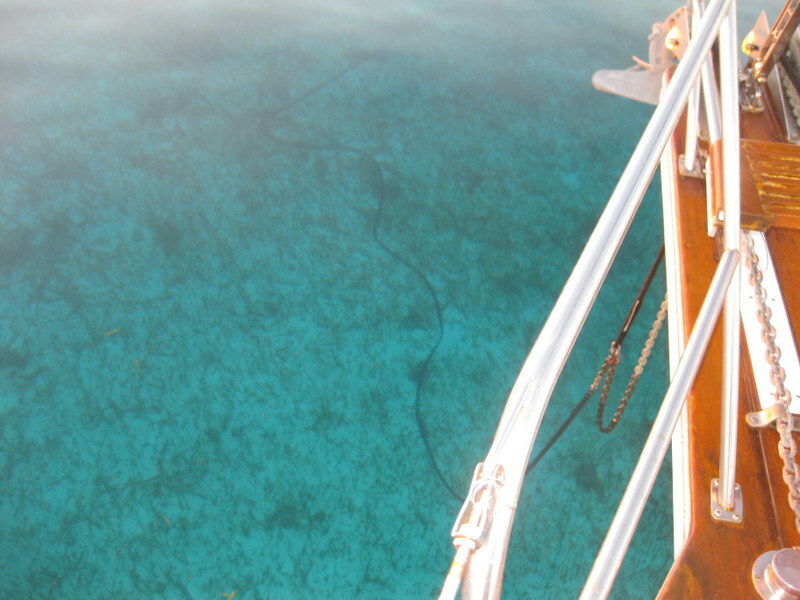 We noticed in the morning that our anchor chain is securely wrapped around an old air-conditioner on the bottom. 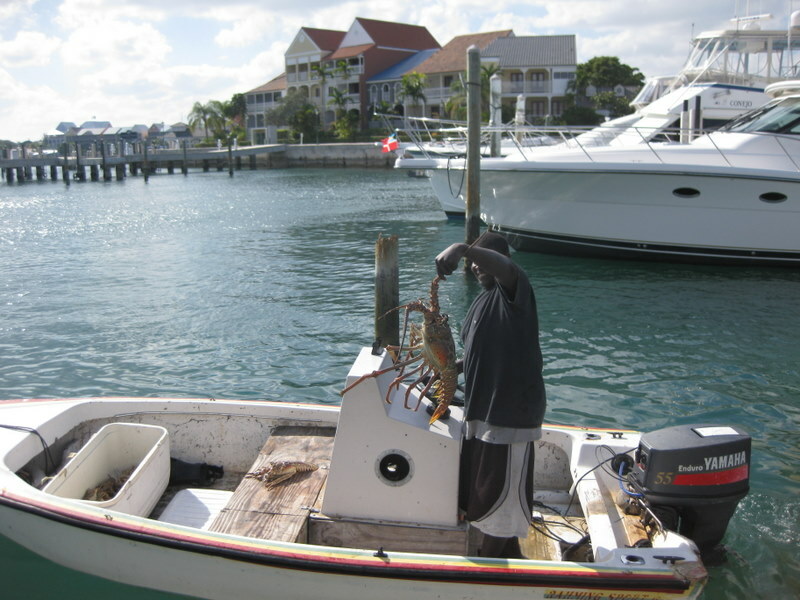 We've been told that the Nassau harbour is filled with such treasures. Brad arrives on Monday and we will leave for the Exumas on Tuesday. All the best for the holiday season to you all and a Happy Birthday to Jackson on the 23rd. This sounds great Glen & Pam, enjoy your christmas visit with Brad over the holiday. MERRY CHRISTMAS TO YOU BOTH! pretty great way to live. fun for all. Happy Christmas. No turkey for you. Maybe Brad will bring one. Thanks for the email. We are all fine here. Sid left on Friday and Hey Jude is still here with us. They plan on moving to the cove and anchoring today. Our good news is that its not a cracked head but there is damage and the engine needs to be pulled, there is a guy who will help Jon with it so all we need is to get the part here from Ft Lauderdale. The mechanic said it would take them two days to do the work and a day to put it back in the boat. We are now thinking about heading over to Georgetown and maybe leaving the boat there on the hard for the summer which would give us a little more time here. If you here of any marinas that have dry storage let us know. We may still meet up with you after all. Take care and have a great holiday.